A potentially deadly fungal disease poses a significant threat to snakes all over the world, new research suggests. The pathogen, has been found in 23 species of wild snake in the US and three in Europe. The fungus causes lesions on the snake's body, leading to infection and death. This study argues that all snakes could become or are already infected. The report has been published in the journal Science Advances. Fungal afflictions have had devastating impacts on a number of different species in recent years. Chytrid fungus has reduced frog populations all around the world, while white nose syndrome has killed millions of bats in the US. Now researchers have evidence of what's termed snake fungal disease (SFD) in a number of populations in Europe and the US. Found predominantly in rat snakes, milk snakes, garter snakes and vipers in eastern parts of the US, it has also been detected in Europe, including in the UK. 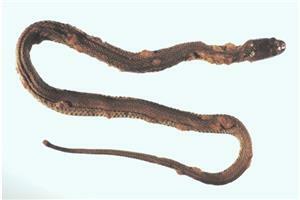 The disease forms lesions on the snake's skin, and can spread quickly and cover a large part of the body. "They start getting these blisters and then all kinds of secondary infections from it, it can kill snakes quite rapidly actually, I've seen them go down in a matter of a few days," lead author Dr Frank Burbrink, from the American Museum of Natural History, told BBC News. "The demographic of the disease and how its really working across all these species and populations are unknown, but we do know that it can take populations down, it can have 100% mortality in some." While moulting can help the animal, many die from infections. The fungus also causes changes in the behaviour of snakes, causing them to spend more time basking in the sun as their skin moults, putting them at greater risk of starvation and attack from predators. To work out the possible extent of the threat, the scientists built a model based on the evolutionary history, ecology and physical traits of known infected species. They looked for associations that could be used to predict which species might be susceptible - the results showed that all 98 groups of snakes in the eastern US could be at risk and the epidemic might extend globally. "There were captive snakes in Great Britain from the 1980s that we knew had this, but it wasn't until 2015 my co-author actually infected them in controlled studies," said Dr Burbrink. "We don't really know if it's getting worse all of a sudden, there are a lot of question marks, we have got to start getting a handle on this and assess how really bad this is. We know it can be bad but we don't how bad it really is." The researchers want other scientists involved in snake studies around the world to keep an eye out for symptoms and evidence of the infection. "Scientists have learned a lot about research and monitoring needs from 25 years of studying the effects of chytrid fungi on amphibians, and those lessons tell us that prevention is the best policy," said co-author Karen Lips, a professor of biology at the University of Maryland, College Park. "Researchers need to work with decision makers to prevent snake fungal disease from spreading, survey museums and field sites to determine the current distribution of the disease, run trials in the lab, and start working on treatments."